In the previous blog we summarized four M.Sc. theses from Dharwad University, Karnataka, India, which give ample evidence that with Homa Organic Farming a healthy micro-flora and micro-fauna in soil is created, thus rejuvenating the soil. This is of utmost importance as nowadays conventional farming which uses a wide range of agrochemicals is destroying this micro-flora and micro-fauna, thus leaving behind a soil which is more and more exhausted, no longer a rich living soil. 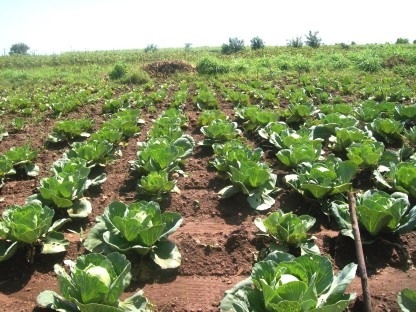 Production comes down and even the supply of food for humanity is at stake, as reports from FAO, the Food and Agriculture Organization of the United Nations state. A healthy soil is the capital for future generations to grow enough food, it is an investment in the future so to say. But equally important is production of enough food of good quality to feed the present population. How does Homa Organic Farming help with that? The four M.Sc. theses mentioned above also examined this question. Plants grown were soybeans, tomatoes, cabbage, and okra. The following table shows a significant increase in yield parameters. We compare Homa Organic Farming (including seed treatment and application of Homa Biosol to plants and soil) with farming without Homa as control. The table shows clearly that both morphological characteristics and yield improved considerably. These results you get when all methods of Homa Organic Farming are followed, including the treatment of seeds, foliar and soil application of Homa Biosol, and also spraying Agnihotra Ash water. One of the results I want to mention especially: The development of root nodules in soybeans. Such nodules we find in leguminous plants like clovers, alfalfa, lupines, and peanuts besides soybeans. Nitrogen-fixing bacteria enter the roots of these legumes and multiply, thus forming root nodules. In these nodules nitrogen gas from the atmosphere (which is easily available there as 78% of our atmosphere is nitrogen) is fixed and made available to plants. When these plants die, the remaining nitrogen remains in the soil, thus improving soil quality and helping growth of plants in the next season. This is of great importance as nitrogen is often the limiting nutrient. How Homa Organic Farming (including the use of Homa Biosol) helps with the formation of root nodules becomes evident by the following photos. The four M.Sc. theses done at Dharwad University, Karnataka, India, also showed good effects of Homa Organic Farming on quality parameters of the foods grown and regarding reduction of pests and diseases. This will be discussed later.